Cool weather means it's time to finalize outdoor chores and cozy up for the long winter ahead. It also urges pesky insects to head indoors seeking food and warm places to hibernate. What can the smart homeowner do? Experts say the record-breaking summer heat has created a bumper crop of bugs. Ohio State University entomologist David Denlinger predicts, "If the warmth stays into the fall, insects will continue to do well until frost comes." Unwelcome pests, like silverfish, spiders, earwigs, flies and ants, are typical fall party crashers. But in the late '90s a new pest appeared: the brown marmorated stink bug. First spotted in Pennsylvania, stink bugs are now in 38 states. "In September and October, when plants are harvested and food sources dry up, stink bugs switch gears and seek shelter indoors," says Dr. Qing-He Zhang, lead scientist and director of research at Sterling International, makers of eco-friendly RESCUE! insect traps. "It's important to break the lifecycle now so they don't survive the winter months." 1. Clean up brush, and keep mulch and firewood piles away from the house to avoid creating habitats for critters and insects. 2. Seal cracks, crevices and holes with caulk or weather stripping around potential entry points, including pipes and utilities. Repair loose roof tiles and screens. Inspect windows and basement foundations, and repair loose mortar. 3. Clean cupboard shelves of loose grain and starch-based and sugary food, and place food in sealed containers or plastic bags. 4. Check where stink bugs hide: warm, dark spaces like baseboards, exhaust fans, ceiling tiles and drapes. Pick stink bugs up with a tissue, and flush them down a toilet. When threatened, stink bugs emit a foul odor, so dispose of any vacuum bags immediately. Zhang explains, "Once you see the bugs clinging to the side of the house or screens, this is a signal that they are ready to get indoors, and more may be coming. The RESCUE! 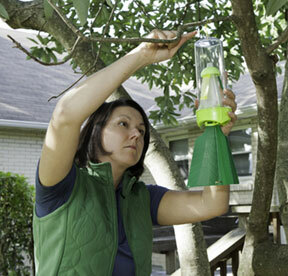 Stink Bug trap uses non-toxic pheromone attractants that lure stink bugs, intercepting them before they reach the house." 5. If ants are your problem, try herbs. Briscoe White, herb expert and owner of The Growers Exchange, says bay leaves, cinnamon and cloves repel ants. Sprinkle dry crushed herbs around doors, cabinets and windowsills to create a natural barrier. Plus, peppermint and spearmint deter moths, too. For more help battling bugs, visit www.rescue.com.